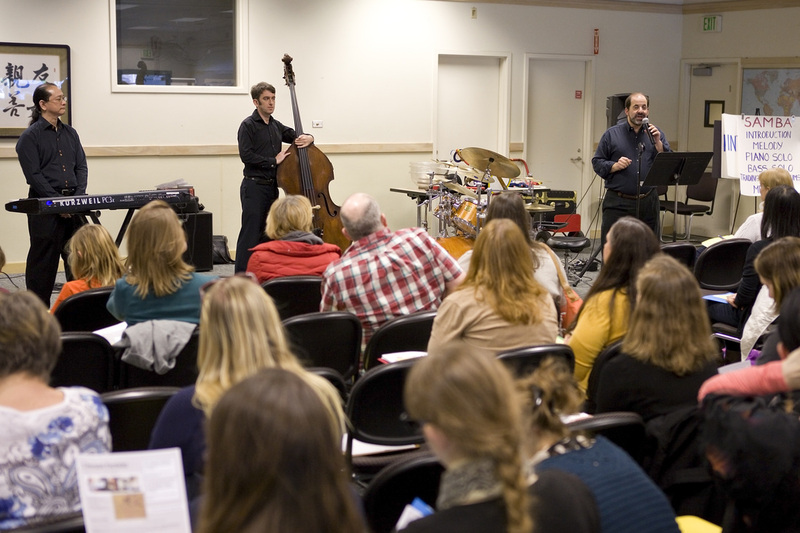 Educational Workshops - Charged Particles: Jazz with a Spark! Charged Particles' teaching activities include workshops, open rehearsals, master classes, and lecture/demonstrations. These activities can be pitched either to general student audiences interested in learning about jazz and the professional experiences of contemporary artists or to musicians who are interested in expert training. "We so loved your performance and workshop​!" ​"Charged Particles' performance at the Pacifica Sanchez library was wonderful. They interacted with all the children, who were fascinated to watch the live music and to try out the different parts of the drum set. Their lively music drew other library patrons to come, sit, and enjoy the songs, all while learning the components of jazz. I'd definitely invite them back! " "Everyone really enjoyed the program..."
"A perfect outing for my class. Thanks." "It was a wonderful program for children!" "Thanks for your wonderful program. All the kids enjoyed the music." were fabulous and a real treat." “I am always looking for things that grab our students’ attention and are fun and educational at the same time. Charged Particles filled those requirements completely." "I can't think of a better way to spend a Friday afternoon. The raves are still coming in from teachers and students alike! Thanks for bringing this wonderful trio to our school, and thanks for great insight and incredible playing." "Thank you for a wonderful afternoon - you delivered such a beautiful jazz musical performance/workshop to the children and families of Belle Haven Child Development Center (preschool). I wish I could find the words to express the facial expressions of all the kids and the appreciation by the adults." "Watching the audiences in the assembly and the workshops and seeing the way the students were connecting, I am extremely glad that the library was able to sponsor this. The three artists gave insightful feedback that aimed right for the age group." "I sat in on their performance, and it was wonderful! Very accommodating group of guys, easy to work with. Filled our Community Room with both adults & families. " “What a great job Charged Particles did in presenting not only an entertaining but also very educational assembly for our students. The performers were able to present the information in a way that all students, regardless of learning level, could benefit." “The students who attended Charged Particles’ concert were especially excited about the performance of such a top-quality group"
"We greatly enjoyed both the workshop they did with our teens and the performance after for the adults." "Saw this trio at a high school inservice for the students. Good times for all. They had the students charged throughout the performance and kept the faculty glued and tapping. They played Soko Ban, Autumn Leaves - picked some more contemporary brains with Got a Match and juiced us with a cut from their new CD. This is happy and active Jazz produced by quality and educated musicians . Thanks from a Jazz oldie - I have the album and play it in my classroom during science labs, along with Brubeck, Rippingtons, Fourplay, Kenny G, Miles Davis etc., with no fear. My students enjoy it completely." "I had a lot of fun playing with you and was amazed by how perfectly everything came together with only a little bit of prep beforehand. It was an awesome experience." "I highly recommend "Charged Particles" and their accompaniment of jazz great, Paul McCandless, following a recent very successful half day of a concert and workshops at our school. "Charged Particles is a great jazz ensemble, each member a knowledgeable, highly talented craftsman, and they brought the main principles of jazz to a level that our Grade 10-12 students could understand and interact with the repertoire. Hearing clear, thoughtful explanations between pieces, the students could see the way in which jazz is full of layers of sound and complexity, yet is improvisatory in nature. "The group's clarity and passion for music of all kinds was apparent as the Grade 12 students asked thoughtful questions that were answered in such a way that it built upon their own knowledge. "Diploma Music students performed pieces in jazz and classical styles for the visitors and were met with great encouraging, specific feedback that could be understood and applied immediately. 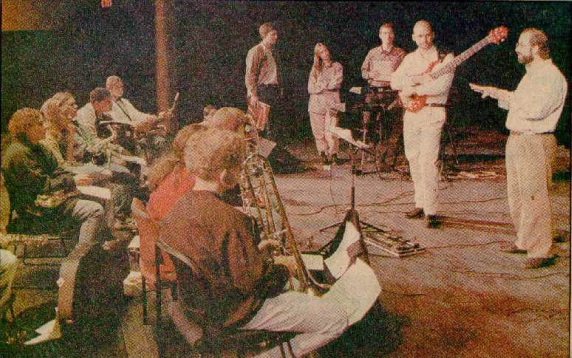 "The hour spent by Charged Particles and Paul in a jam session with an extended group of students, who had a variety of interests and abilities in jazz, was a real 'buzz'. Jazz standards were played, and skills were developed. "Several students received personalized and highly practical input. I saw a student drummer change his whole playing style from more of a stylized and sight-reading approach in a jazz band to a relaxed, supportive, and refined jazz playing style. Similarly, a classically-based pianist improvised (she had no choice and rose to the occasion!!) when called upon to add her musical ideas. "The students came out of this event with a greater appreciation of jazz, more ideas to use in their studies and university lives, new thoughts on performance nerves, and a thoughtful approach to their own musical growth. "I came out of it with great ideas, new perspectives, and feeling greatly encouraged." '[My daughter] tends to guard her emotions, so to hear her express appreciation for the musicians and what they shared was pretty neat. Furthermore, to get teenagers excited about a different genre of music is not easy. The presenters did a wonderful job of sparking an interest in jazz. So thank you! "This was a high point for our school in music! We are so grateful for all the work that this band put into our school. We hope they can come back again!"